2 How to Check for Updates and Download Firmware for Galaxy Devices? Samsung has released the One UI custom skin based on Android 9.0 Pie official stable update for the Samsung Galaxy S8, Note 8, S9, and Note 9 variants globally. While most of the users have already received the official OTA update on their devices, some of the Galaxy device owners didn’t get the OTA yet due to some issues. It may be because of device update settings over a carrier data connection or something else. As we all know that most of the smartphone manufacturers offer gradual roll-out process so that everyone gets a secure and complete update. It’s even based on the device variants like RAM/storage or IMEI number series. If you’re also facing the same issue in terms of the OTA updates, you can update your Galaxy S8, Note 8, S9, and Note 9 to One UI Android 9 Pie manually. The Android 9.0 Pie was one of the major Android versions released by Google last year. This update brings a lot of cool new features and so many system improvements as compared to the Android 8.0 Oreo. All the customized features like swipe gesture navigation, app slices, digital wellbeing, app timer, recent UI, new notification panel & icons, volume sliders, etc. In addition, Samsung has developed its own skin named One UI and that’s great. 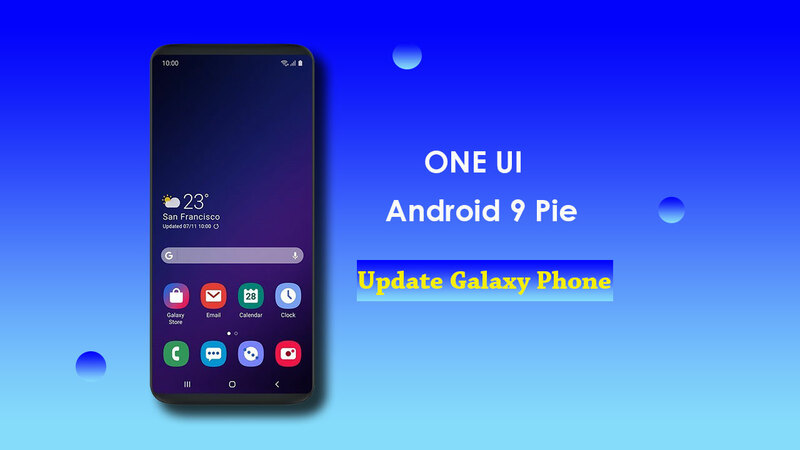 The One UI brings all the Android Pie goodies to the system along with some of the user-friendly core features or options like the dark theme, system optimization, recent UI, icons, themes, and one-handed simple UI. The one-handed user interface is awesome and specially built for the bigger screens like Galaxy S8 / S8+, Note 8, S9 / S9+, Note 9 models. Now, the Galaxy S10, Galaxy Fold, and some other flagship-range Samsung devices also come with One UI out-of-the-box. The Mobile Carrier brands of Galaxy S8, Note 8, Galaxy S9, and Note 9 devices have also started rolling out the Android Pie update via OTAs. However, some of the device variants didn’t get the latest update yet automatically. But you can do it manually as well. Generally, it takes a couple of days to receive the official stable OTA update to the Samsung devices globally. But if anything goes wrong or delay, it may take a couple of weeks as well. So, you should wait for the OTA update notification for a few days more. Otherwise, you can update and install the latest One UI Pie firmware on your Galaxy devices via Software update tool and flash tool manually. If you’re an advanced user and know all the basic steps and requirements of flashing any Stock or Custom ROM via Odin Tool on any Samsung device, it will be easier for you. Otherwise, you can check out the steps on How to Flash/Install Stock Samsung Galaxy Firmware Using Odin (2019) for the step-by-step flashing process. How to Check for Updates and Download Firmware for Galaxy Devices? If you’re kind of unaware about how to check for Samsung Galaxy device updates and which is the latest firmware file till date, you should know about SamFirm Tool. SamFirm is a free & deprecated tool which allows you to revert changes made to your phone/tablet after the root or flashing custom ROM. If you want to revert back to official releases by Samsung Firmware or simply wants an updated firmware version for your Galaxy model, SamFirm Tool will do it for you. You can download the SamFirm Tool from here and install it on your PC. Connect your Samsung phone and put all the device details on this tool and check for the latest firmware files. It will directly fetch all the latest firmware versions available for your device based on the region from Samsung Servers and will download for you. Then you can easily flash the ROM file via Odin Flash Tool.